BANGKOK (Bloomberg) -- Rolls-Royce Motor Cars Ltd. forecast a second year of record sales as growth fueled by Asian wealth outweighs the economic slump in Europe. BMW's superluxury unit is on track to sell more than the 3,538 vehicles it delivered last year, when it had the highest sales in its 107-year history and beat the previous record set in 1978, CEO Torsten Mueller-Oetvoes said in an interview. A slowing China, which became Rolls-Royce's biggest market in 2011, won't prevent it from posting back-to-back record years, he said. "What we see particularly in Asia is strong growth for us," Mueller-Oetvoes said in an interview this week in Bangkok, where Rolls-Royce plans to open a showroom in the Siam Paragon shopping mall. "Many of the Asian economies are strong and the forecast regarding ultra-high net-worth individuals is positive." Rolls-Royce, which makes the $246,500 Ghost sedan, is counting on the rising number of millionaires in Asia to help drive demand as the debt crisis dents sentiment among Europe's rich. Asia accounts for about 40 percent of the carmaker's sales and that share will probably rise, Mueller-Oetvoes said. Of the 100 top billionaires in the world, 13 are from Asia, according to the Bloomberg Billionaires Index. The Asian billionaires' combined estimated net worth has increased 4.3 percent to $196.3 billion so far this year, according to data compiled by Bloomberg. The Asia-Pacific region overtook North America with the most high-net worth individuals in 2011, Cap Gemini SA and RBC Wealth Management said in the World Wealth Report 2012. In China, the pace of growth has decelerated and is no longer as "explosive" compared with the past few years as the world's second-largest economy slows, Mueller-Oetvoes said. "We all know that the economic development has slowed down a little bit over the last year, but I mean at the end if you look at the prognosis it's still five or six or seven percent growth," the CEO said. "I would call it a more consistent, steady growth pattern in that market now." 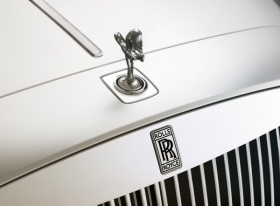 The company sold out of a $1.2 million Year of the Dragon Phantom model introduced in China earlier this year. Features of the special-edition Phantom include a gold dragon hand-painted on the side of each wheelbase, the mythical creature embroidered on headrests, and hand-stitched cushions for rear passengers. Among the other regions for Rolls-Royce, the United States accounts for 30 percent of sales, while the Middle East and Europe each account for 15 percent, according to the company. There is "still some potential" in the U.S. market, while Europe is a "mixed picture" with the UK market still holding, he said.